Hotel le Crytal Lobby in downtown Montreal. What better way to weather the wintry cold than to travel north for a long weekend of icy immersion in Montreal? The logic seems skewed, but the warmth of the staff, décor, and outdoor Jacuzzi of Hotel Le Crystal convinced us that Montréal, Quebec, Canada was the perfect city for a mid-winter (or summer!) getaway. At Le Crystal, all guests are quickly greeted by highly professional staff and a stunning crystal chandelier as they enter the luxury hotel in the financial district of Montréal. With oversized furniture in hues of gray, ivory, and purple in front of you, and a waterfall on your right, you enter the lobby of an operation that clearly pays attention to detail. Also home to La Coupole Restaurant and Amerispa (both of which have children’s menus), one need not leave the building to experience the unique, French-inspired opulence Montréal has to offer. But of course, you should. Whether you’re with kids or on a couples weekend, the location of Hotel Le Crystal provides easy access to Montréal hotspots. The Bell Center, home of the Montreal Canadiens hockey team, Saint Catherine Street (shopping), an indoor ice skating rink, outdoor parks, and numerous restaurants are within walking distance of this centrally located hotel. Also within walking distance is Tourisme Montreal, the Tourist Information Center of Montreal. Here, locals can give you ideas for exploring other parts of the city, easily done when there’s a metro stop (CDN3$ for a regular fare) within a five minutes’ walk of the hotel. 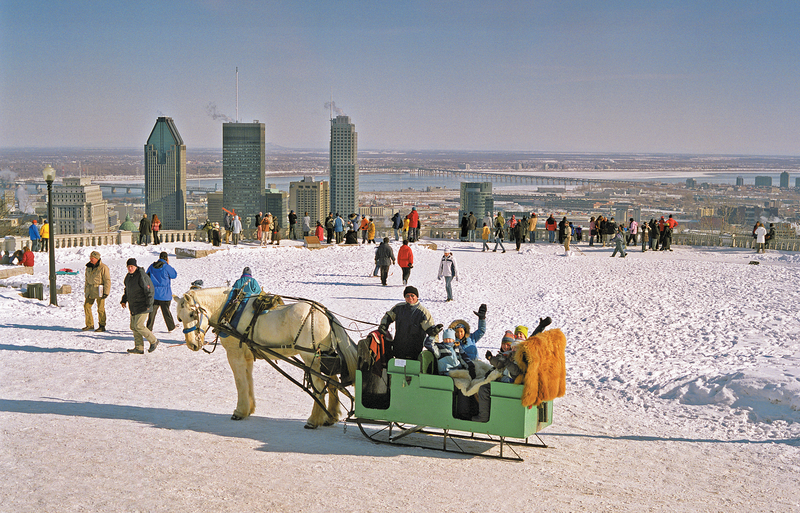 In the deepest, coldest days of January and February there are many wonderful, kid-friendly museums in Montreal that we recommend you visit. If you’re traveling with family over 18, checkout IglooFest which brings thousands outdoors at the Old Port to listen to the latest electronic music spun by famous DJ’s. Join a snowshoe tour of Mont Royal Park, open to ages 12 and up. And if that sounds too cold, head indoors to the new indoors, glow-in-the-dark Putting Edge minigolf course in Centre-Ville. As the days get longer and warmer, the city begins a calendar of spring festivals to keep visitors of all ages cozy and entertained. The best known is Nuit Blanche, part of the two-week-long Montreal en Lumiere festival, now in its 12th year. The outdoors, brightly illuminated event takes place overnights during the last weeks of February and the first days of March. Expect to bundle up and explore the city in a totally creative region bordered by Old Montreal, downtown, the Plateau Mont-Royal and the Pole Maisonneuve. A free shuttle runs between all scheduled events so you can hop on and off to sample the live street performers, video installations, music, art exhibits and the winter fairyland in the Place des Festivals. The Montreal Museum of Art is hosting a special spring kids camp and family activities around its major show, “Marvels and Mirages of Orientalism,” including art workshops for ages 2-5. Some other favorites include the Montreal International Children’s Film Festival, usually held in early March and Les Trois Jours de Casteliers Festival. This is a celebration of the most unusual puppet arts from various countries and the shows can be appreciated in any language. The Théâtre Outremont is conveniently located in Mount Royal at Outremont and is easily reached by Metro. Too chilly to explore downtown Montreal on foot? Not to worry — stay active in Le Crystal’s health center. Access to free weights, treadmills, stationary bikes, yoga balls and more challenge individuals of all fitness levels. Supplement your workout with laps in the indoor, salt-water swimming pool with an expansive view of the city. There’s a lifeguard on duty and lots of kid-oriented water play toys. Afterwards, unwind in the sauna or outdoor, rooftop Jacuzzi. After a long drive through a blizzard, this Jacuzzi was our first stop after checking into the hotel, so don’t forget a bathing suit! 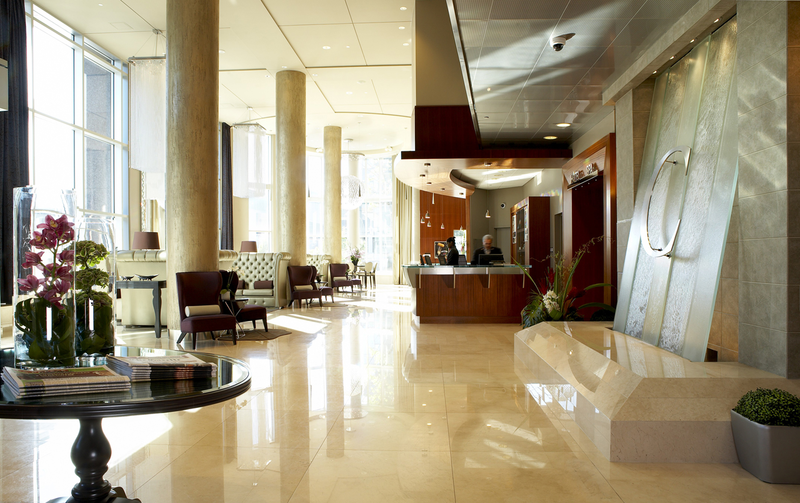 Sometimes work gets in the way of unwinding completely, but the business center, located on the third floor of the hotel, provides Wi-Fi (also available free for guests throughout the entire hotel), desktop computers, a printer, and other services to ensure the job can be done conveniently and quickly. This ensures all guests can get back to enjoying the hotel’s other amenities or the charm of the city at large. Dress warmly and in layers. At every establishment the heat is plentiful but you’ll want to have enough clothing to protect you from the chilly winds when you’re out on the streets. The Hotel Le Crystal (514/861-5550) is located at 1100 Rue de la Montagne, Montreal, QC H3G 0A1 and you can check their website or call their staff to inquire about seasonal specials. At our visit, the Bed & Breakfast package was priced at CDN210$ per night in a suite and their family offer, with two connecting rooms, morning breakfast, and cookies, milk and popcorn for the whole family, was CDN275$ per night. We also recommend other Montreal family-friendly hotels. For more activities and a current events calendar, visit the Tourisme Montreal website. 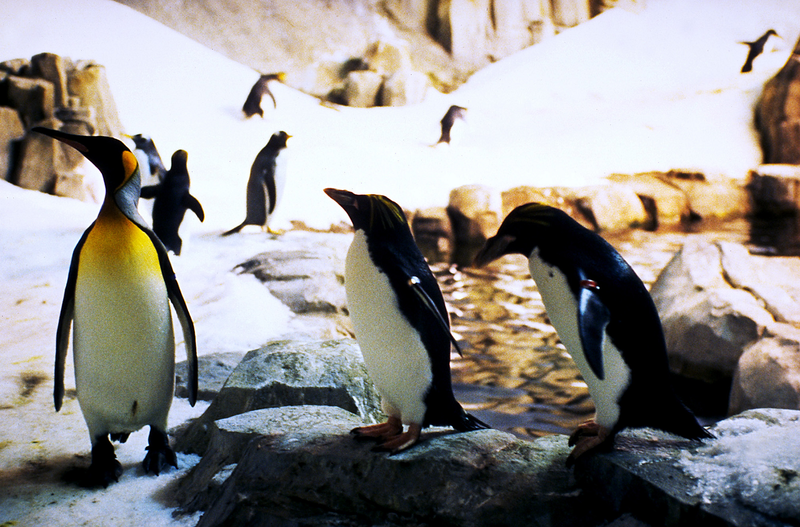 Photos courtesy of Tourisme Montreal include Mount Royal Park, Montreal; Photo by Stephan Poulin and Penguins in Arctic Habitat at Biodome of Montreal; Photo by Sean O’Neill. Photos of Hotel Le Crystal courtesy of the hotel. In spite of all the cold weather we have been experiencing, this story makes me want to head up to Montreal for a frosty weekend of fun. The Montreal en Lumiere festival sounds like a winner, as does the hotel. Thank you for the terrific seasonal suggestions!